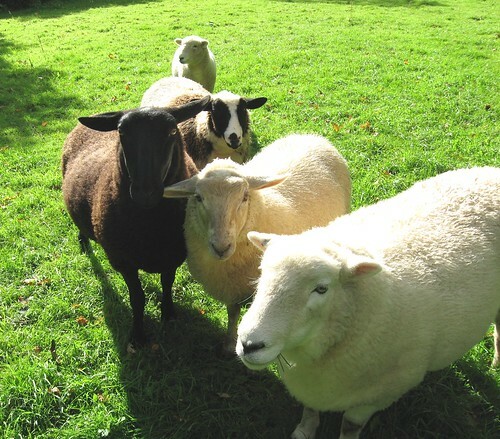 We keep a mixed flock of sheep, including Devon Closewools, Shetlands, Polled Dorsets and various crosses. The prime reason for getting some sheep was to keep the pasture down, – it just seemed the easiest way to deal with the grass, and it turned out having the little flock was a real joy. We did lamb in the first years – but now we no longer have easy access to a ram, we tend to replace stock by buying lambs from other local shepherds or from the local market. We keep them for at least three years, giving them a longer life and because we favour mutton over lamb. The first year the shearer came and we were left with our first three fleeces – it came as a pleasant surprise that there was wool too! I enjoy the sheep as much as their wool; they all have different characters and come up to me for pats, and I often have a flock following me as I walk the fields, and for us, it is important that the animals have a good life.